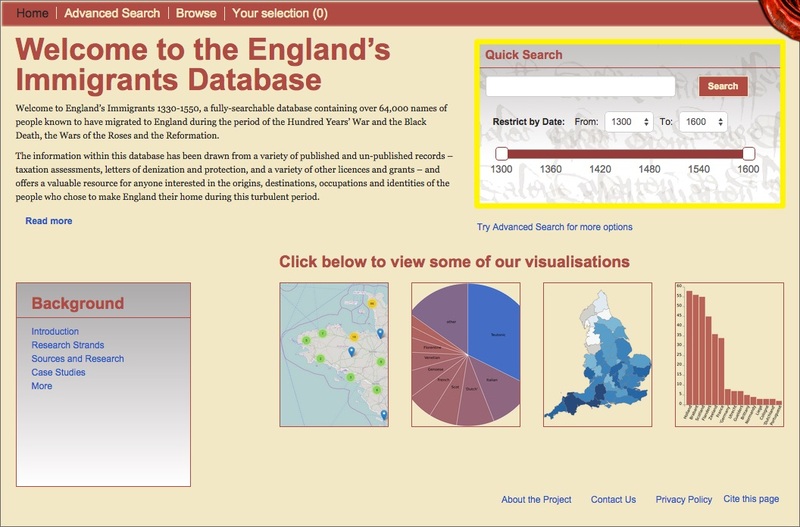 From the home page of the England’s Immigrants database you can perform a Quick Search by using keywords to produce a list of results. This allows you to make a quick search of more than 64,000 records for a specific keyword. You can use any keyword, such as name, place name, date, nationality, origin, occupation, social status, relationship, or document type. You can also enter ‘*’ to bring up all the records in the database. You can also do this by clicking Browse. It is important to bear in mind that a keyword search for ‘brewer’ would return those whose occupation was brewing, as well as those who might use ‘Brewer’ as a surname. The keyword search will search every field and all text, not only those which appear in specific fields in the Advanced Search. You can search for suffixes such as ‘Senior’ or ‘Junior’ only through the keyword search. From the Quick Search you can also restrict the dates of your search results by choosing from the two drop down menus beneath the text box, or by clicking on the timeline to choose the time frame you want. You can use the browse function to view the entire body of records on the database. From here you can further refine the results by using the refining tools on the left hand side. In order to get the most from the database, there are a few tips and tricks to bear in mind while searching. The wildcard search can be a useful tool to search through different spellings of names. For example, searching in the surname field for ‘Fren*’ could bring up results of all those with names like ‘French’, ‘Frensshe’ or ‘Frenscheman’. If you're trying to find a particular person and you're not sure of the spelling, you can add a combination of likely characters to see if they appear. For instance, searching 't*l*r*' in the surname field will show all immigrants with the surname of 'Tailor' or a variant of that spelling, though you may find you have some extras in your hit list however, such as ‘tiler’. You can also search for two different keywords together by using AND or OR between your keywords. For example, ‘York AND Tailor’, which will search for records which match both keywords, or ‘Flemish OR Dutch’ which will produce a set of results of records for either keyword. Finally, If you search ‘York’, your results will only display those immigrants living in York, not the whole of Yorkshire; however, searching for 'Yorkshire' gets you those from the rest of Yorkshire but not York itself. To get immigrants living in both York and Yorkshire in your search results, you can use a wildcard search by searching for 'York*'. 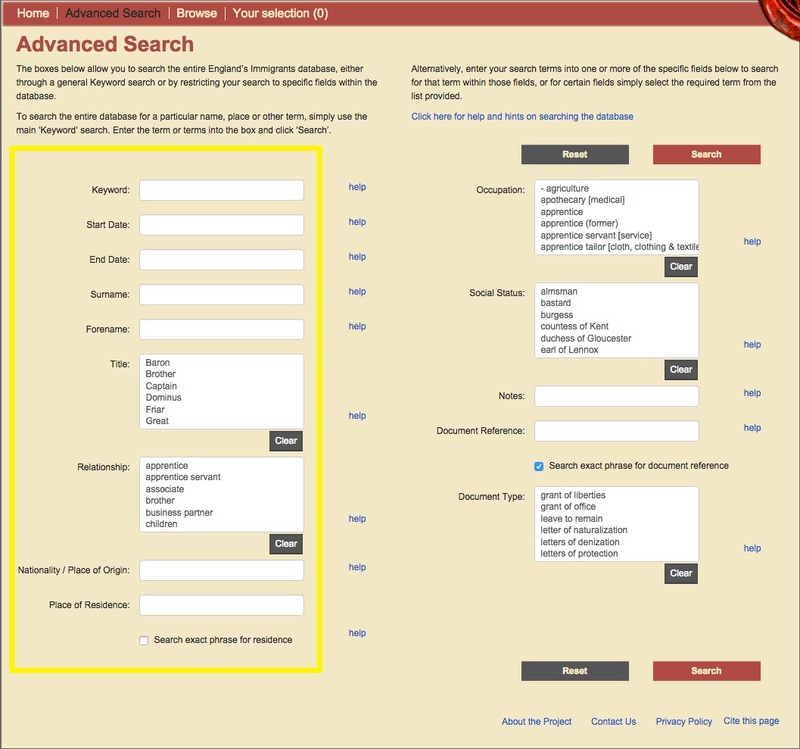 The Advanced Search page allows you to refine your search by specifying the particular database field or fields you wish to explore. There are a variety of different types of information you can search: you can specify records from a particular date or date range; search for a personal name or a place; or select people with a specific title, occupation or social status. The Keyword search works in exactly the same way as the Quick Search function on the homepage, and allows you to search for a specific term in any field of the database. The Start Date and End Date fields allow you to restrict your search to a particular year or period. To search across a range of years, enter those years into the relevant boxes. To search for a single year, simply enter it into one or other of the boxes. Names of individuals can be searched using the Forename and Surname fields. Surnames have been entered into the database as they appear in the manuscript or printed source, retaining the original form and spelling. In many cases, particularly for obvious occupational, national or geographical surnames, or for well-known individuals, a standardised spelling is also given. This appears in the Full Record, in square brackets after the original, for example 'Carpentyre [Carpenter]', 'Frenschemon [Frenchman]'; both versions are searchable. Particles between the forename and surname, such as 'de', 'le', 'ap', 'of', should not be included in the search. Forenames have generally been entered into the database in the usual modern English form, in most cases translated from the original Latin. However, unusual, unclear or obviously native forms of forenames have retained their original spelling, with a standard form in square brackets afterwards where possible. Certain names have been left in their Latin forms, since there is either no clear modern form, or a number of different possible translations, for example 'Jacobus', which could be either James or Jacob. Missing or illegible surnames or forenames have been entered as '[...]'. If a name has then been supplied from a related source, it will appear in square brackets afterwards. Where an individual was given an alias in the same entry, for example 'John Frenchman alias Robert Carpenter', both names have been included in the record, the first as the main name and the second as an alias, with all forms being searchable. Alternative names discovered in other documents may be recorded in the notes, but will only be searchable via a Notes or Keyword search. The Title field lists the descriptive titles given to any of the individuals contained within the database. These descriptions appear before the person’s name in the original records, and may represent status or office, such as ‘Sir’, ‘Brother’ or ‘Friar’, or merely be descriptions or ‘nicknames’, such as ‘Great’ or ‘Long’. Such titles were not regularly recorded in the sources, and so are relatively uncommon. Titles appearing in any other related sources have not been included, but may be mentioned in the Notes. Titles are not shown in the search results table, but appear as part of the individual’s name on their Full Record page. The Relationship field has been used to link together records for people who are known to have had a connection with each other, such as husbands and wives, or masters and servants. These are generally relationships explicitly stated in the documents concerned, but may occasionally be with people in other documents, or links established by other means. Details of the precise relationship will be found on the Full Record page, and may be explained further in the Notes. As well as linking people to other related individuals, this field has also been used where possible to link multiple records relating to the same individual, using the term ‘same’. However, records have only been linked together where the identification is either explicit or relatively certain. Relationships contained within the sources surveyed have been included, but it has not been possible to perform a fully comprehensive search for other relationships or for references to the same individual, particularly within the extensive tax records for London. Therefore, while the appearance of a link represents an explicit or reasonably certain connection between two or more records, the lack of a link does not necessarily mean that they are not related; they may still have a connection, or relate to the same individual, and users should exercise their own judgement when analysing the data. Details of known relationships with people who do not have their own record within this database, for example native neighbours or employers, or relatives overseas, may be found in the Notes or Occupation fields, and are searchable via a Keyword search. The Nationality/Place of Origin field can be used to search for an individual's country, region, city or town of origin, or their nationality. Cities and towns appear in their standard modern form, with the original spelling recorded afterwards in italics if different, such as 'Zootleeuw (Lewe)'. Both forms are searchable. Most towns are recorded in their native modern spelling, but major cities are given their English version where that is commonly used, for example 'Florence', rather than 'Firenze’. Medieval states or regions are generally recorded in their standard form, but again, if the spelling is unusual or identification at all uncertain or imprecise, the original form is shown in italics, such as 'Anjou (Angeo)'. Also, if the document records both a town or city and a region, and the region given does not correspond with the location of that place, a common error, particularly for places in the Low Countries, the corrected region is given first, with the region given in the document noted in italics afterwards. For example, if the document said ‘Brussels in Flanders’, this would be corrected to 'Brussels, Brabant (Flanders)'. Nationalities are recorded as given in the original source, with all spellings standardised as necessary. However, if a nationality appears to be given incorrectly in the source, or does not correspond with any town or city also noted, the original is retained but with the more usual nationality for that town or city added in square brackets afterwards; the scribe was probably mistaken, but it is possible that the individual may also have been an immigrant into that city before coming to England. The same applies if a vague nationality can be narrowed through other information, with the original given first and the more precise term added afterwards, e.g. 'Dutch [Zeelander]'. All forms are searchable. States, regions or nationalities inferred from other information are given in square brackets. Unidentified places or regions are shown in italics and inverted commas, e.g. 'Gretlet', with any suggestions given in the Notes field. All places, regions and nationalities have, where possible, been assigned to their modern state or states, and these are also searchable via this field. Where a region or nationality now corresponds to more than one modern state, such as Flanders or Brabanter, all possibilities have been included; hence Flanders and Flemings are associated with France, Belgium and the Netherlands. However, if a city is also given, only the modern state of that city is used. Some nationalities, such as ‘‘Easterling’’, are too vague to be associated with modern states, and others do not necessarily correspond to the modern terms or countries of the same name, for example ‘‘Dutch’’, ‘German’ or ‘Greek’. Thus modern states have not been given unless other information is available. Where modern and medieval states have the same name, the search will return both, and the results can then be refined from the Search Results page. Also, please note that different sources often used different terms for people from the same place, or terms which were more or less precise, especially for people from the Low Countries. For instance, inhabitants of places within the bishopric of Liège could be described as Liègeois, Dutch, German, or even as Clevelanders, Guelderlanders or Brabanters. Nationalities given in the sources have always been retained, and corrected or improved if necessary, but supplied nationalities have been given as precisely as possible. Also note that some cities lay in more than one state, and borders regularly changed, so people from the same town could have different states or nationalities at different times. Place of Residence refers to the place where each individual was recorded as living in the record concerned. This could be a village, town or city, a parish or ward, or simply a hundred or county, or indeed, not be recorded at all. For ease of searching, spellings have been modernised wherever possible, and unidentified places appear in inverted commas, often with suggestions in the notes. To allow better geographical analysis of the data, additional details such as county, hundred or city have been supplied where necessary. Please note that places have been associated with their historic county, such as Cumberland or Westmorland, rather than any modern administrative units. To search for people performing a specific Occupation, simply select the term from the list. To select multiple occupations, hold down the <Ctrl> (PC) or <command> (Mac) key and left-click on the terms required. The selected terms will be highlighted, and can be de-selected by clicking on them again while holding down the <Ctrl> or <command> key. To remove all the currently selected terms, click 'Clear'. Occupations have been entered into the database as they appear in the original document, with Latin terms translated and English spellings standardised. However, as a result, the list contains numerous words for what were effectively the same or very similar jobs such as ‘capper’ and ‘capmaker’ or ‘hatter’ and ‘hatmaker’. Most occupations have therefore been grouped into rough categories, to allow searches to be made across a variety of related occupations and trades. These categories appear in the list preceded by a hyphen, for example '- clergy' and the category assigned to an occupation appears in square brackets after it, such as 'baker [food & drink]'. Please note that some individuals were given multiple occupations in the same record. These were mostly just different terms for similar occupations, or 'servant' plus the task they were performing, but some were entirely unrelated, such as ‘butcher alias tailor’. Unidentified occupations appear in inverted commas. For many individuals, their occupation is accompanied by additional details, such as their master's name, e.g. 'servant to John Smith', or the church in which they served, e.g. 'rector of Crudwell'. In most cases, place names will also be the place of residence, and alien masters will have their own entries in the database, but all other such details, including the names of English employers, can be searched using a general Keyword search. However, please note that, while place and institutional names have been modernised wherever possible, most personal names have been entered simply as they appear in the source, and therefore spellings may vary. The Social Status field contains all terms used in the documents to describe the status of specific individuals. These are generally terms that appear after the person’s name (rather than Titles, which appear before), and include titles of rank such as ‘knight’ or ‘gentlewoman’, descriptions of marital status like ‘spinster’ or ‘widower’, and other terms relating to personal circumstances, such as ‘burgess’, ‘almsman’ or ‘poor man’. 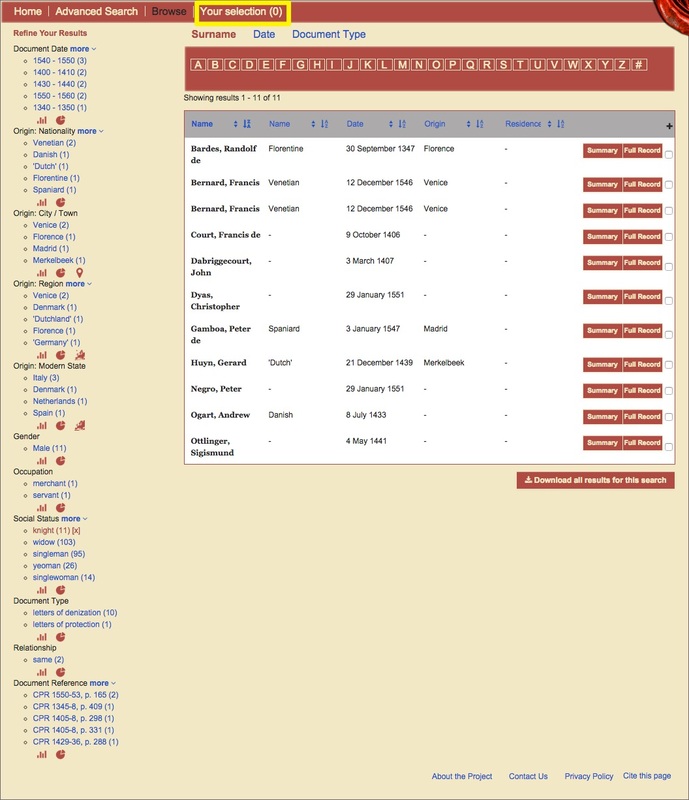 All such titles included in the database appear in the list. Simply click on the term or terms required and click ‘Search’. To select multiple terms, hold down the <Ctrl> (PC) or <command> (Mac) key and left-click on the terms required. The selected terms will be highlighted, and can be de-selected by clicking on them again while holding down the <Ctrl> or <command> key. To remove all the currently selected terms, click 'Clear'. If you know the reference of the document you wish to search, simply enter it into the Document Reference field. To search original archive material, enter the full lettercode reference for the required document (e.g. ‘E 179/71/79’), or for printed or calendared primary material, enter the abbreviated title of the volume as found on the Full Record page (e.g. ‘CPR 1476-85’). Do not include page or membrane numbers. For more general searches, enter part of the reference (e.g. CPR) and uncheck the 'exact phrase' box before searching. Results can then be refined using the options in the left panel of the Results page. A full list of abbreviations used can be found via the Browse function. The Notes fields can contain a wide variety of additional information relating to particular people or documents, and all can be searched using the 'Notes' search. The Notes and Biographical Notes fields contain details such as further information given in the core record itself such as relationships with other people or details of tax payments. There may also be biographical information taken from other sources such as references to other original documents or secondary works, explanations for how certain conclusions have been reached or suggestions for details which are unclear or not given in the source. Document Notes generally refer to the physical condition or origins of the source, or to any doubts over the date or contents. If the search term appears in a Document Note, all individuals from that document will be displayed in the Search Results, and the notes can be found by clicking on the reference from the Full Record page. To return to the advanced search, reset your search, or to amend your search, click on ‘Your search’ at the top of the results page, which is highlighted in blue. You can also reset your search fields by clicking ‘Reset’ on the right hand side of the page. Once you have performed a search and have a set of search results, you can organise your search results in a number of ways to get the information you need. One way in which you can organise your search results is by choosing the details you can see in the columns of your search results. By clicking the blue downwards arrow next to the categories at the top of your search results, you can choose which field you want to see. By clicking the blue arrow next to the black arrow, you can organise the search results in alphabetical order of that category. You can refine your search results by using the drop down menus on the left of the search results. Once you have your search results, by selecting, e.g. ‘Knight’, under ‘Social Status’, the database will show you all those in your original search that held the status of ‘Knight’. The selected field will appear with ‘[x]’ next to it. You can see more options by clicking ‘more’, next to the category heading and ‘all’ from the drop-down menu. Once you have refined your results, you can do so again in the same way with a different category to focus the results from your search even further. To return to your original list of search results, click on ‘Knight [x]’, which will remove the filter. You can also select records to view later by clicking the box on the far right of each entry in the list. Once you have selected your records, you can view them by clicking on ‘Your Selection’ at the top of the page. It is a good idea to make a note of your search terms because your selection may not be saved for future use. You can download your search results as a Microsoft Excel CSV file by clicking the button ‘Download your search results’ which appears at the bottom of each page of results. This will download your entire search, not just your current page. As the database records the instances of contact with immigrants over the period, rather than the individual, there may be multiple records of the same immigrant. Therefore, it is possible to track an immigrant’s location and wealth through time by using surviving tax returns for subsequent years. If you search for all the people in a particular place for example, the same person might be returned multiple times because they appear in multiple sources. In many cases it is impossible to distinguish between records of one immigrant with the same name as another forty years later. In order not to distort the original records, it is the searcher’s responsibility to use their judgement and interpretation when calculating statistics for the numbers of immigrants, to ensure that some are not being counted twice. You can remove the duplicates by selecting the records you wish to view by clicking the box on the far right of each entry in the list, then viewing them by clicking on ‘Your Selection’ at the top of the page. Underneath the list of options under each category at the left of the search results, there are two or three icons. By clicking on the icon, you can generate a graph showing the number of results in each category. By clicking on the icon, you can generate a pie chart which shows the percentages of each result in each category. generates a map with modern political boundaries. The category ‘Residence: County’ shows a map of density of immigrants with the historic counties of England. Once you have generated a visualisation, you can download them and the data they represent as an image by clicking the icons underneath the image. You cannot download an image from the Google Maps visualisation, though you can take a screen-shot from your computer. You can also switch between different representations by clicking the alternative icons underneath the image.